The railway station waiting room is chosen as a symbolic home for the final public installation in early December: a historic point of departure from and arrival to Rijeka. The train station is a marker of this city’s historical identity because it was built during the Austro-Hungarian Empire in the mid-1800s as one of key access points to the Adriatic for the Empire. This train station marked the moment when the city of Rijeka was connected with Central Europe for the first time by railway and became Budapest’s port access to the sea. Rijeka grew into a strategic and established port city, as well as a significant industrial city, which kept its “blue collar” identity until 1990s. Over the past 20 years, Rijeka’s port, railway, and ship-building industry has been undergoing a slow and difficult process of loss and transition. Still without a clear itinerary of where it is going and when it will arrive there, Rijeka is aware of the need to adapt its identity. If the city were a train, it would be stalled on the tracks full of passengers who still don’t know what the plan is. The current General Urban Plan (GUP) presented in 2006 prioritizes city’s identity transformation, re-purposing and re-structuring some of historically industrial and port-related areas in the city’s center, including the area along the railway strip and the nearby segment of the port that physically cuts off the city center from the sea. From the beginning, this port city on the Adriatic Mediterranean was planned and built without providing its citizens free access to the sea, which was kept separate by a high stone wall along the railways and the port. Concurrent with the city’s plans for future, many of its citizens have lost and are still losing their jobs at the remaining working factories—those which haven’t already been brought to bankruptcy or closed down in the war‐torn period of the 90s. Residents are insecure about their future just as much as the future of their city. Many are skeptical that this city will ever prosper again without its industries because other economic bases will be challenging to sustain in the context of Croatia today. The story of the port and railway is a powerful metaphor for the narrative of Croatia itself, which has seen great success, crushing failure, and drastic change over time. A Waiting Room for People, Machines, and the City (exhibition documentation) 2015 from Film & Video Art Lab on Vimeo. Groys has also said that the utopian energy to improve a city is now increasingly being channeled into tourism. Mid-sized cities are shifting away from industry and towards more lucrative ways to support the changing economy, and tourism is often a viable revenue generator many cities are buying into. The failure of a city to maintain its industries is an indicator of larger shifts that involve power plays between cities, countries, and global economies. Čekaonica za ljude, strojeve i grad (A Waiting Room for People, Machines, and the City) is a multi‐channel audio/video installation that invites citizens, workers, experts, tourists, and passersby to witness markers of Rijeka’s challenges and possibilities, and to interpolate the installation as it interlaces with the daily routines of the station itself. 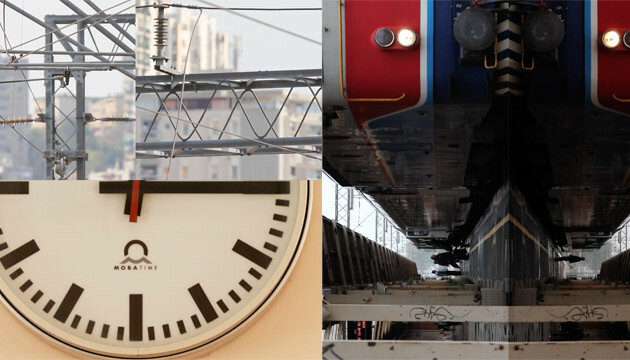 Factors typically thought of as interference have been choreographed into the timing and placement of the public installation such as passengers disembarking and moving through the station, passersby walking through the waiting room, and the surrounding mechanical and traffic noise from the trains, the port, and cars. All of this is intentional and considered part of the work. Throughout the duration of the event, several “interruptions” will become integrated in the piece as well—the regular arrivals and departures of four trains: the 17:10 departure of train Rijeka to Zagreb, the 17:55 arrival of train Ljubljana to Rijeka, the 20:40 departure of train Rijeka to Ljubljana, and the 20:47 arrival of train Zagreb to Rijeka. The station used to be a central point in the city’s urban tissue but is considered marginal today due to lack of use and the outdated Croatian railway systems that make travel by train unappealing. The installation will be composed of four synchronous projections, which will form a ceiling-size fresco-like video installation in the railway station waiting room with multi-speaker surround sound, which will be installed in four corners of the room. The video channels are interconnected and intertwined in the editing process. At times the moving images will be connected, at times they alternate, swap sides or directions, at times parallel imagery appears, or the channels blend into a whole-ceiling single large image. The work has been produced using HD, 2K and 4K cameras with wide-angle and tele optics, as well as quadricopter aerial views of higher altitudes such as the lighthouse. The artists Nadija Mustapić and Toni Meštrović start with a documentary approach to capturing the aesthetic, social, historical, and textural qualities of a certain place. In contrast to traditional documentary, they focus on abstraction and the construction of poetic narratives found in the audio-visual material they gather. Therefore, the definition of documentary becomes wide and expansive as a means of mediating our relationship with reality and of interpreting the world around us. This piece is a way of conjoining a highly technical and media‐oriented art production with a production of a site‐specific public intervention, which is not merely a screening. Visitors will find themselves viewing an art piece that is about waiting—for Rijeka’s transition of identity—within the context of the waiting room at the city railway station. The waiting room and the participants in it (in the video and visiting the public installation) become a part of the work themselves, implicated in the change that the site—and the city—is undergoing. This project would not be possible without the partnership and support of the City of Rijeka, the Port Authority, the Croatian Railways, Plovput and INA Refinery. Boris Groys, “The City in the Age of Touristic Reproduction,” Art Power (Cambridge: MIT Press, 2008),105.